Doctor Strange is finally making his way into the Marvel Cinematic Universe. The movie has been in production for a while and has a release date of Nov. 4th. 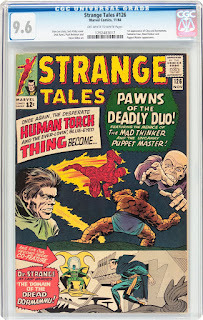 Also, Kevin Feige (President of Marvel Studios) has confirmed for us that the Dark Dimension will be featured in the movie and Strange Tales #126 has the 1st appearance of the Dark Dimension. How much of the it will be seen in the movie is yet to be known so I guess we'll all have to wait for it to come out. 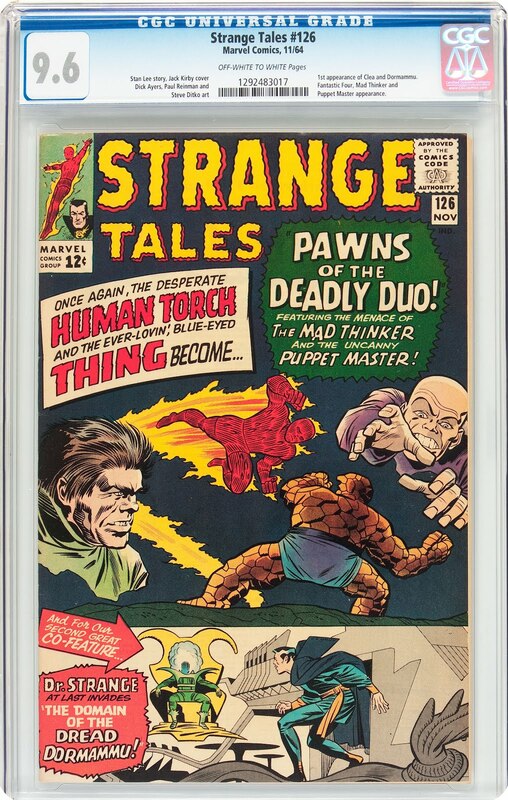 However, when mentioning the Dark Dimension, we must also mention Dormammu, since he is it's ruler and Strange Tales #126 also has the first appearance of him. He may or may not appear in this film but I can almost guarantee that if the Doctor Strange movie is a success, he will appear in one in the near future. But wait, there's more. We also have the first appearance of Clea. Clea is the love interest of Doctor Strange. It would only make sense to add her to the cast as she is a big part in the life of Doctor Strange. At the time of this writing, there have been a total of 346 copies graded by CGC with 2 being a highest grade of 9.8 NM/M. Both are Universal grade. Surprisingly, demand for this book hasn't really taken off since the news came out. As you can see by the chart from gocollect.com, a lot of grades have seen a fall in price for graded copies. That could mean that either people are not fully aware of the key issue status, which seems unlikely, or it could be that they are just overlooking it for something else. Either way, that could be good news for you if your looking to get a deal on this comic.